2013.11.26 : Under 12 years old can't stay. Rakkojae means a house to enjoy the old time, thus, the place where people peacefully relieve the tiredness from trip while enjoying the old times. Rakkojae was built to harmonize the old time and modern life utilizing the 130 year-old traditional house and opened as the guesthouse and cultural experience facility. 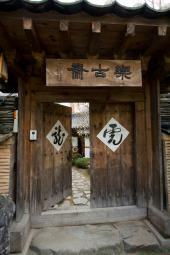 Though the entrance gate suggests its long history, it is a rustic and clean traditional house inside. There is a yard with a pond, traditional fence, chimney and plants such as bamboo and pine tree behind the house. The floor where guests are requested to take off shoes adds the taste of Korean tradition. Rooms have a selection of inner room, Cheuksil (side room), summerhouse and annex. Inner room is furnished with healthy ondol using natural stones which finely warms up the room in winter and it provides a precious experience of Korean heritage. Rooms are equipped with shower and toilet and facilities are more sophisticated than regular guesthouses. Guests can enjoy yellow mud sauna and complimentary breakfast with a selection of western meal and Korean meal. There is also a Korean tea ceremony experience available in a summerhouse. The guesthouse offers a Korean traditional instrument experience as well. The guesthouse was recently featured in a drama and TV show, and gathering attention from all generations. The guesthouse is used not only by tourists but also groups from cultural and academic programs to touch traditional cultures. You can enjoy a unique experience staying at the Korean traditional house with a full of cultural experience. ※ provide clothes for the sauna. ※ Customers who stay in the annex also available. We will prepare a King and Queen custume.